Referencing the photo above I can't read the chat. Not sure what the reasoning is to put an image as a background to a chatroom. Too busy. Chatwing is a free social chat room software that is used on over 50,000 websites and many social communities. 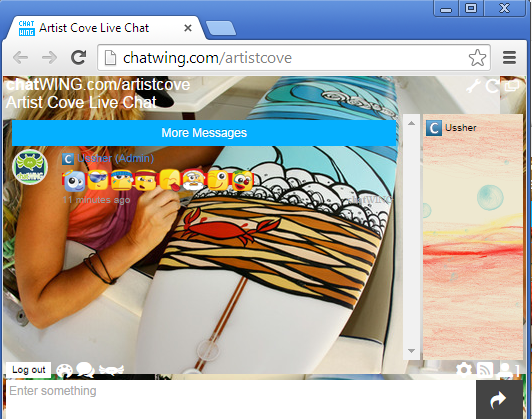 Chatwing provides free, fully hosted, and fully customizable chat rooms. Customize every aspect of your chatwing rooms, assign moderators, ban users, delete messages and Chatwing is the only social chat room software that is fully supported on all mobile devices. Chatwing also has Android and IOS, iphone+ipad mobile apps so you can get instant push notification alerts when people are chatting in your room or send you a private message. Each chatwing chatbox can have over 18,000 live chatters at any moment which also makes chatwing the most scalable, free chat solution online. How to integrate Chatwing into your JomSocial Community? How to Integrate Chatwing to your Joomla Extension?